When the globetrotting Australian film scholar Sam Rohdie died in April of 2015, academic film studies and cinephile culture lost a unique voice. Teaching and writing variously in Australia, Ghana, Britain, Hong Kong, and in his final years the USA, Rohdie’s path was an increasingly singular one. In the early phase of this international career, culminating with his 1971-4 tenure as editor of the venerable UK journal Screen, Rohdie was situated at the very centre of cutting-edge developments in film theory and serious criticism, and the often hot debates therein. During this crucial period, he was one of the most lucid English-language writers on then-current French film theorists such as Christian Metz. Later in his life, Rohdie adopted a much more distanced position on such debates and film theory itself, either questioning its primary tenets (many of which can be traced back to that seminal early-‘70s period when Screen was its Anglophone bible) or more often seeking to leave such discussions behind. The result was an increasingly personal, even idiosyncratic, approach to writing on film, the author adopting a reflective, meditative, poetic, and most importantly aphoristic style that sometimes gives the impression of extremely developed journal or travel writing more than reference-flooded film scholarship. Despite his exponential embrace of an aphoristic style, Rohdie’s final twenty-five years also saw a concurrent expansion of his writing projects’ scope via a series of books. These either concentrate on the great Italian post-war filmmakers (starting with what remains the seminal English-language study of Michelangelo Antonioni in 1990, followed by volumes devoted to Luchino Visconti’s 1960 masterpiece Rocco e i suoi fratelli/Rocco and His Brothers, Pier Paolo Pasolini, and Federico Fellini) or more conceptually focused work. These are all, in more and less explicit ways, concerned with the theme and question of modernism in the cinema. Fittingly, the final book in the cycle is simply called Film Modernism. If this topic and the related subjects and figures he elected to write on at length are today well known enough, Rodhie has played an important part in making this so. He was, for example, one of the key figures responsible for the return to scholarly interest of both Antonioni and post-war modernist cinema more broadly (which can now be situated as part of the much larger, trans-disciplinary emergence of modernist studies over the past two decades). Familiar and relatively canonical as Rohdie’s interests might ultimately be for recent film scholarship, his conceptual approach and style are anything but. In a period when academic cinema studies variously pursued a kind of ‘historical turn’ emphasising industrial and sociological context, the would-be scientific ‘post-theory’ formalism of David Bordwell et al., or rearguard theoretical writing usually overflowing with references to other published work in the area, Rohdie was a true outsider. His books encompass history but in the broadest yet also deepest sense; the writing tends to specific filmic texts but only so as to make a point and move on; and the discussion offers philosophically inflected analysis (and sometimes touching on key points or assumptions of ‘Theory’ without highlighting the fact) without turgid explication. All this is presented through often meditative and increasingly aphoristic writing that remains clear and succinct, no matter how elaborate its syntax and lengthy the sentences can become, usually featuring only scanty references. Concurrently adding substance to and operating far beyond scholarly film culture’s forever-fickle zeitgeist (especially in the area of writing), taken as a body of work Rohdie’s books comprise one of the true gems of sustained, thematically focused writing on the cinema we have in English. This cycle reaches its entirely apposite conclusion with the arrival of Film Modernism. 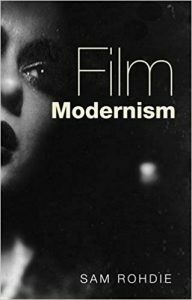 Substantively complete at the time of the author’s death, with the manuscript then edited by long-time associate Geoffrey Nowell-Smith, Film Modernism exemplifies Sam Rohdie’s interconnected passions: European, especially Italian, cinema of the post-war period, and the ongoing question of film modernism. If you have read one or more of his previous books, a strong sense of déjà vu permeates these pages, which often read as capsule-size, fragmentary summations of more elaborate discussion undertaken elsewhere. And, I think it is fair to say, there is little in the way of genuinely new thinking here. The book is also at times rather repetitive, in part I suspect because the author was not able to complete his own final edit but also in part due to its particular organisation. This lingering sense and occasional annoyance aside, the book’s unusual structure is largely successful, and a perfect vehicle for Rohdie’s late style. This emphasis on modernism’s paradoxical power and sometime tendency towards auto-critique or even -destruction is one of the book’s strong through-lines. Ever since the Antonioni book, Rohdie’s work has stressed a primary impact of modernist cinema as being the dissolution of all distinctions and sureties, both at aesthetic and conceptual levels. If one of the features of modernism itself is encompassing paradox and contradiction, while Rohdie’s final book itself, on the one hand, presents modernism as a radical evolution beyond classicism and realism, on the other it shows how their forms are concurrently both clarified (as ‘past’) and re-iterated anew via more complicated, reflexive, and multi-vocal guises. Classicism thereby becomes ‘modern’ through being self-consciously cited and reborn via particular authorial eyes. But if classicism is presented as objective while modernism is characterized as subjective, how can we explain Antonioni’s cinema – central in the story of post-war modernism, most would agree – and that of many others (such as Chantal Akerman) for the way such work radically detaches the camera’s gaze from a sense of character or overall subjective involvement in the drama or scenario? One of the many contradictions – some of them explicitly framed and addressed, others less so – at the heart of Film Modernism, here perhaps not fully explored, is that both classicism and modernism are in fact ‘autonomous’ in the sense of being removed from real life when inspected up close. Yes, as opposed to modernist gestures of difficulty and alterity, classicism features a kind of ‘transparent’, easy realist aesthetics driven by formal rules and enshrined by commercial dictates, rather than allegiance to the actual real world, so that the viewer is encouraged not to notice the heavily coded, industrialised means by which on-screen worlds (one always very different to that which we know) are presented on screen. But Bordwell and many others have long argued that classical Hollywood cinema is in fact no less artificial or, in fact, reliant on viewers’ intellectual processes than modernist films are, and only doesn’t seem like ‘work’ because its conventions are so familiar and doggedly adhered to. And while modernism is often seen as seeking a rarefied and radical autonomy (and thereby an apotheosis when it comes to romantic definitions of art), in another sense it can be seen as a genuinely realist response to actual history as it unfolds since World War Two via an aesthetics now much less transparent. If modernist films look ‘strange’, and make less narrative and moral sense than Hollywood productions, that is because the increasingly media- and image-inflected and defined modern world looks, sounds, and feels this way. Ten pages later, Film Modernism hits upon the truly challenging aspect of cinema’s power, subsequently spread out to encompass television and now the explosion of audiovisual culture online. “Generally, Godard does not distinguish in this way between ‘essential’ and ‘inessential’ images,” Rohdie writes. “Unlike most film directors, he doesn’t use some images as weak links in a narrative chain leading to strong ones, but only images which, in addition to serving a narrative function, also have independent value.” (‘Insufficiency’, p. 100) No image is inherently closer to reality than any other, more deserving of our respect or attention, as reality itself has become increasingly difficult to define when it comes both to what it looks and sounds like but also which (or whose) values drive its continuation in such a form. And today, delineating the audiovisual world from ‘reality’ seems increasingly difficult or unviable. Ever since cinema’s arrival, films have variously responded to reality’s appearance and perceived substance. But the latter has also responded to, and been influenced by, the moving image. In 2017 any argument about the directionality of this relationship seems hopelessly naïve. In this sense, with all its internal contradictions strengthening rather than undermining its importance, modernism emerges as ever more central to our understanding both of audiovisuality but also of life itself. It is this between-ness that now characterises reality itself for many of us in the developed world: a forever uncomfortable, rushed, incomplete, discontinuous, fragmentary, exponentially uncanny, ubiquitous multi-media experience that finds its earlier aesthetic expression in the cinema often described as modernist. Sam Rohdie’s final book, for all the occasional confusions or repetitions, succinctly bears witness to, expresses, and interrogates this non-linear history, giving it expert valedictory yet newly contemporary voice.